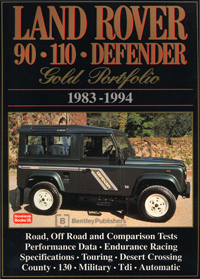 This Land Rover 90, 110, Defender Gold Portfolio: 1983-1994 is a collection of 47 original articles compiled from the pages of Autocar, Car, Car South Africa, Car and Driver, Diesel Car, 4x4, Land Rover Ltd, Modern Motor, Motor Trend, Road & Track, and What Car?. The information collected in these reprinted articles includeds 12 on & off-road tests, plus specifications , touring and long-term reports. By the end of the 1970s lack of investment meant that the marque was now outdated. The introduction of the 110 in 1983 with improved suspension and more luxury was long overdue. The short-wheelbase 90 came just over a year later. These new models were aimed at the higher end of the market. Sales were steady due to longevity and reliability and the Defender replaced the 90 and 110 models in 1990. The Defender had the option of the 200Tdi diesel engine and had power-assisted steering. This is a book of contemporary road tests, technical data and specifications, with offroad reports, background information and driving impressions.